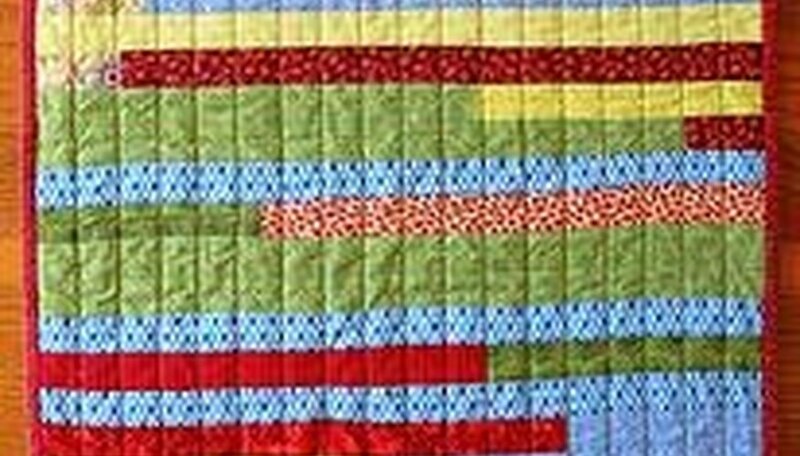 A quilt using strips of fabric to form a decorative cover is called a strip quilt. It is one of the easiest types of quilts to make and is perfect for the first-time quilter. Different sizes of rectangular pieces of fabric can be used or the strips can all be the same size. Some strip quilts even have pieces formed our of angled rectangles where the fabric may be wide at one end and narrow at the other end with the next strip forming the opposite shape. The stripes, in a strip quilt, usually go in a horizontal pattern rather than up and down. Decide on a strip quilt size. Although a quilt can be made with any dimensions, the basic sizes are: 36 x 36 inches for a lap quilt, 36 x 54 inches for a crib quilt, 65 x 88 inches for a twin bed quilt, 80 x 88 inches for a double bed quilt, 86 x 93 inches for a queen bed quilt and 104 x 93 inches for a king bed quilt. Choose your fabric. Every seamstress has fabric scraps folded and tucked away. This is a perfect project to use those bits and pieces. Or you may want a quilt with very specific colors and purchased fabric specifically for this quilt. Either way, you must keep just a few rules in mind. You will need to purchase or have fabric long enough (with a bit extra for salvage) to span the width of your quilt. Cotton is most often used for quilts although you can surely use any fabric that appeals to you. The next rule when choosing fabric is not to put two of the same style together. In other words, don't place two large patterned pieces together, two small patterned pieces together or two solid pieces together. The only situation that breaks this rule is if all the fabrics are of the same style. Other supplies you will need are backing fabric. This can be a white or cream piece of fabric, even muslin. It can be a solid color or one of the fabrics you have chosen for the quilt top. Make sure that it is wide enough for the entire quilt or you will need to purchase enough to piece the backing for the size needed. Purchase a piece of quilt batting the size of your chosen quilt. You must wash and dry your fabric before starting to make sure that it won't shrink after the quilt is completed. Cut and sew the fabric strips. The thickness of each stripe is a matter of preference. They can be 1-inch thick or 6 inches thick or various thicknesses. Just remember to allow a ¼ inch seam allowance to all the sides. The easiest way to cut fabric strips is with a rotary cutter and mat, but you can also use a yard stick and pencil or blue quilter's pencil to measure and draw the size before cutting. When all our strips are cut out you are ready to sew them together. Quilts require only a ¼ inch seam allowance as opposed to garment seams which are 5/8 inch. Pinning your piece together will ensure that the edges come out fairly even. Just keep adding another piece until the quilt top is formed to meet the required length. Trim both the right and left sides of the quilt if there are uneven edges. Press all the seams down as opposed to open as you would with garment sewing. Make a quilt sandwich. Place your quilt backing on a table or floor, right side down. Next put the quilt batting on top and then the strip quilt top, right side up. There are two easy methods for keeping your quilt from slipping while doing the actual hand or machine quilting. The first is to use large safety pins and the second is to use large running stitches (basting) through all three layers. Either way, you will start at the center of the quilt and move outwards up and down, across and from corner to corner. Quilt your strip quilt. If you are an advanced quilter, you might want to hand or machine quilt your piece. If that is the case, you would have transferred a design onto the quilt top before making the sandwich. For beginners, you can choose between two different methods, tying or machine quilting in the ditch (seams). Tying can be done with a large eyed needle and embroidery floss. Use all six strands of the floss and cut each piece 5 inches long. You will tie your quilt in the seams randomly throughout the quilt. From the top of the quilt make a stitch, but don't pull the floss all the way through. Remove the needle and tie a double or square knot on the top of the quilt. After all of the ties are in, trim them according to your preference of length. The second easy quilting form is to machine stitch in the ditch (seam) across the quilt from one side to the other. Set your machine at a slightly larger stitch length. Start in the middle of the quilt and work outwards alternating each side (top and bottom) of the quilt. When finished with either method of quilting, trim all the pieces of the sandwich quilt to match the quilt top. Bind your quilt. Cut strips of fabric for the outside binding. Usually this is done with all the same fabric. If you don't have pieces long enough you can piece them together and then cut them to lengths long enough for the top and bottom of the quilt and two side pieces, plus an extra inch on each side. If you are making a smaller quilt the width can be 2 inches which will include two ¼ inch seams. For a larger quilt you can add an inch. There are no exact rules about the width of the binding, but these are good guidelines. Press each piece of binding in half lengthwise, right sides out. Then press a ¼-inch under on one side of the length all the way down. Starting with the top and bottom of the quilt, pin the raw edge (not the folded under edge) to the quilt top, right sides together. Sew both binding pieces. Trim the binding to match the edge of the quilt. Fold each side of the binding over at the middle crease to the back side. Hand stitch the back of the binding to the quilt. Sew on the side bindings. To start, fold over the end of the binding approximately ¼ inch to make a neat edge and then sew until several inches from the opposite edge. Trim the biding to leave ¼ inch and fold it over before sewing to the end. Complete the quilt by folding the two side bindings to the back at the middle crease and hand sew them to the back as you did with the top and bottom. If you decide to use fabric, for your strips, that isn't long enough to match the width of your quilt, you can piece the them. Cut and sew them straight up and down or at an angle for some added interest. Karen Ellis has been a full-time writer since 2006. She is an expert crafter, with more than 30 years of experience in knitting, chrocheting, quilting, sewing, scrapbooking and other arts. She is an expert gardener, with lifelong experience. Ellis has taken many classes in these subjects and taught classes, as well. How Much Backing Is Needed for a Queen Quilt?